Have you ever wanted to make your iPhone completely silent but still alert your when someone calls, or when you receive a text? It is possible to silence the ringing and the vibrations, but still receive notifications by flashing the LED light on the back. 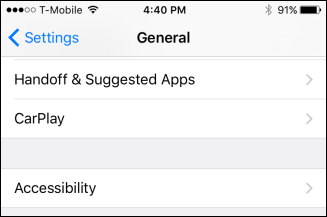 This trick is very simple and will only take a few seconds to perform, but it may very well save you a great bit of hassle if you mute your phone for an important meeting or conversation, and then forget to unmute it. At least now you’ll have some indication that someone is trying to get a hold of you. To start, open the Settings and then tap on the “General” option. Next, scroll toward the bottom and tap on “Accessibility”. 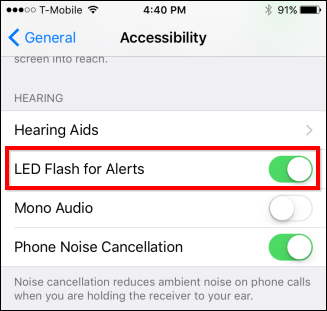 Finally, turn on the option “LED Flash for Alerts”. Now, your iPhone will flash when someone is calling you, you receive a text, or some other notification that alerts you. For example, if you use Facebook Messenger, then your phone will flash once when you receive a new message. Just remember, the flash on your iPhone is pretty bright, so it will be glaringly obvious that it is alerting you. Keep this in mind when you are in an important meeting or a darkened theater because it could be just as distracting as when it rings and/or vibrates. 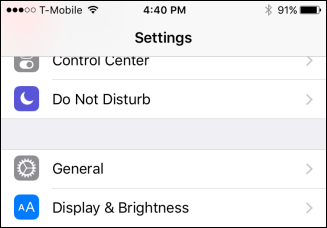 On the other hand, if you have your device totally muted, you can easily see from across the room when someone is trying to get in touch with you.